Death: 30 Mar 1939 in Washington D.C. The remains of Mary C. Ingels, widow of the late Charles Ingels of this city, whose death at Washington, D.C. was reported in the Advocate Thursday, arrived at Greenville Saturday afternoon accompanied by her daughter, Miss Nelle L. Ingels and a niece, Miss Bertha Crutchley of Washington. The remains were taken to the Donnell Funeral Home where thay remained until the hour of the funeral which was held at 2 p.m. Sunday at the Greenville Methodist Church, by the Rev. Ronald T. Nickerson, and burial was made in the family lot at Hazel Dell cemetery. A quartet composed of Miss Leila Johnson, Miss Lucille Beckie, R.W. Wilson, and Roy M. Jett sang.The pall bearers were nephews, C.C. Yeck, George Augustine, Cicero Kimbro, Francis Wright, and Ledger Denny. 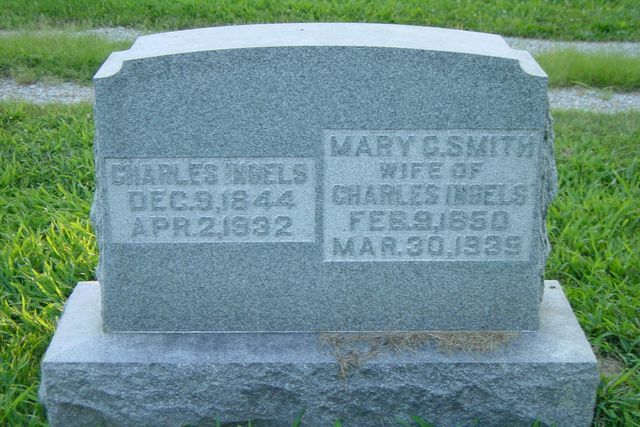 Mrs. Ingels maiden name was Mary Catherine Smith, a daughter of Mr. and Mrs. William Smith and she was born February 9, 1850, at Coldren, New Jersey, and was aged 89 years and one month and 21 days. At the age of three her parents moved to Ohio and when she was 14 years old they came to Bond county.She was educated in the schools of Ohio, attended normal school and became a teacher at the age of 15 years and taught many schools in Bond county. On February 11, 1880, she was married to Charles Ingels at the Woburn Methodist church, the ceremony being conducted by the Rev. Van Meter. Mrs. Mollie J. Hawkins of Donnellson aged 92 years was one of the bridesmaids. Mr. and Mrs. Ingels were the parents of two children, a son,dying in infancy, and a daughter Nelle L. Ingels, attorney for the Federal Power Commission at Washington. A foster son, Edgar D. Ingels, a civil engineer, died at New Orleans La. in 1918. Mr. and Mrs. Ingels lived in Greenville many years, at various times living on farms adjacent to Greenville. Following Mr. Ingels death at their home on North Locust street, this city, on April 2, 1932, Mrs. Ingels went to Washington and has resided with her daughter and a niece, Miss Crutchley. She was one of seven children and was the last of her immediate family. Her father was an early singing teacher. Mrs. Ingels remained young. She was a busy woman and a kind providence permited her to remain active until the end of life's journey. She attended the "Greenville College party" at Washington the night before she was stricken with a cerebral hemmorrhage on Friday afternoon and while she was very ill, she was concious until a few hours before her passing at 7:45 a.m. Thursday at their home in Ontario Apartments, at Washington. Short funeral services were held at 4:30 p.m. Friday, at the Gawler Chapel by the Rev. William A. Keese, pastor of the Metropolitan Memorial Church at Washington.Frank K. Sanderson connected with the presidents staff at the White House, a former resident of Greenville sang at the service. Mrs. Ingels became a member of the Methodist church at an early age. Those here from a distance to attend the funeral were Mrs. Leora Bell of Champaign, a sister of Miss Crutchley, Dr. C.E. Molden and daughter Dellagene of Troy. Mr. and Mrs. Ledger Denny of Sorento, Mr. and Mrs. Ciscero Kimbro and his sister of Fillmore, Mr. and Mrs. Will Ingels of Patoka, and Mrs. Lillie Wright of Donnellson, Misses Abbie Fender and Ida Truit of Hillsboro, Mr. and Mrs. George Augustine of Woburn, Mr. and Mrs. C.C. Yeck of Smithboro, Miss,Miss Ida Barber, and Miss Bertha Thacker.